Specific pre-natal fitness classes are fantastic. Not only do they modify the workouts to ensure they are safe but effective, but it’s a great opportunity to meet like minded mums. Limit your intensity; you should be able to hold a conversation throughout the whole class. If you can’t, just take down the intensity a notch until you can. Stay in a normal range of motion; during pregnancy we have the hormone relaxin in our bodies. This means we can stretch further therefore we are at a higher risk of pulling our muscles. Listen to your body; if it doesn’t feel right, don’t do it. Our bodies are fantastic at telling us when something is wrong so it is important to listen to it. Make sure you tell the instructor that you are pregnant. A lot of instructors are knowledgeable of the adaptations and modifications that need to be made during their class. If they are not, it’s probably a good idea to find an instructor who does. Exercise classes, such as dance and step, that require you to change direction quickly and rotate at the torso are probably best left alone until you are post-natally recovered. If you have any of the following, you should check with your doctor or midwife whether it is safe for you to exercise PRIOR to beginning any exercise programme. IMPROVED CIRCULATION - Your growing uterus can put pressure on your veins, which can restrict (not completely) the blood flow returning back to your heart which can cause your legs to swell. Exercise can improve blood flow. LOWER BACK PAIN - Yoga, pelvic tilts and water workouts like pre-natal aqua aerobics can offer relief from lower back pain, especially during the latter stages of pregnancy. HEALTHY WEIGHT GAIN - A lot of the time we are told to 'eat for two', but healthy eating and regular exercise can help you avoid excessive pregnancy weight gain. We all gain some weight but research shows that active pregnant women may put on 7 pounds less than a pregnant women that do not exercise. Physical activity is good for you and baby. CORE STRENGTH - Core strength can be a benefit during labour, although we don't recommend any abdominal crunches or sit ups, maintaining a good posture whilst performing pregnancy appropriate exercises can increase your core strength. CARDIOVASCULAR FITNESS - Incorporating cardio exercise into your workout can increase your body's ability to be under physical stress for longer periods of time, this can be handy during labour. IMPROVED SELF IMAGE - Weight gain is inevitable during pregnancy and 100% natural but some women, myself included, struggle to seeing their body adapt to creating a baby. Healthy eating and regular exercise will help you keep these changes to a healthy level. MAINTAIN YOUR FITNESS - If you exercised regularly before becoming pregnant, then exercising throughout your pregnancy can ensure you maintain some of that pre-pregnancy fitness. Although don't expect to break any records. POST-NATAL RECOVERY - Women who get out and exercise during pregnancy are more likely to continue with their exercise regime once baby has arrived. Make sure you WARM UP at the start of any activity and COOL DOWN at the end. KEEP TALKING – It’s recommended that you should not exercise beyond the ability of being able to comfortably speak, if this is the case, take the activity level down until you are able to speak easily. AVOID any high risk or high impact sports such as horse riding, contact sports, etc. If you want to try a new activity then yoga, pilates, swimming and walking clubs are ideal. If this is an instructor led activity, make sure you inform the instructor that you are pregnant. You should avoid ALL exercises that require you to lie on your front after the first trimester, and avoid ALL exercises that require you to lie on your back after your second trimester. This adaptation may need to be brought forward if you feel uncomfortable in any of these positions. Speak to your Midwife or Doctor BEFORE starting any exercise programme or if you have any concerns. STAY HYDRATED – Keep a bottle of water nearby. Don’t set unrealistic GOALS, during pregnancy we are looking to maintain around two thirds of our fitness levels so no breaking any personal bests in the 10k. Keep those ENERGY LEVELS up by not exercising on an empty stomach. A banana or some nuts are a great snack. It is good to KEEP COOL during exercise, pregnant women can overheat quite easily so make sure you exercise in a well ventilated area and take a break if you feel you are getting too hot. Make sure you wear comfortable and appropriate clothing for exercising when pregnant, clothing that SUPPORTS your bump and breasts are best. 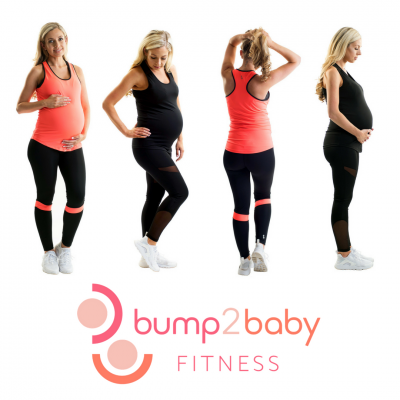 Such as, the Bump2Baby Fitness Maternity Activewear range. If you experience any of the following symptoms or become uncomfortable during exercise, STOP EXERCISING IMMEDIATELY and consult a medical professional.